Bagasse is the fibrous remains after sugarcane stalks and sorghum stalks are crushed and processed. Minimal element chlorine-free bleaching is required to turn the fibers white. 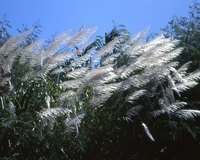 The fibers maintain a tan or light brown coloring if not bleached. Homemade bagasse paper does not require bleaching but does require the fibers to be completely dry before beginning the process. Make 100 percent bagasse paper, or substitute one cup of cotton lintel to add strength to the paper. Pour two gallons of water in the rectangular plastic container. Place 1 1/2 cup dried chopped bagasse and 3 cups of water into the blender. Blend on high for one minute. Pour the bagasse solution into the water basin. Repeat the process one time. Use your hand and stir the solution in the plastic container. Evenly distribute the fibers through the water. Put the two parts of the deckle together with the empty frame on top and hold firmly. Slide the 8-inch edge of the deckle into the water next to an 11-inch edge of the plastic container. Slide the deckle along the bottom of the container until it is completely submerged. Slide the deckle back and forth along the bottom of the container. Continue the motion and lift up slowly until the deckle is entirely out of the water. Hold above the container, allowing the excess water to drain. Remove carefully the top frame from the deckle. Center and place the chamois over the top of the bagasse paper. Press the chamois lightly to begin absorbing the water on the bagasse paper. Quickly flip the deckle over so the chamois is on the bottom and laying on a flat surface. Gently remove the screen from the surface of the paper. Allow the paper to dry 24 hours before use.